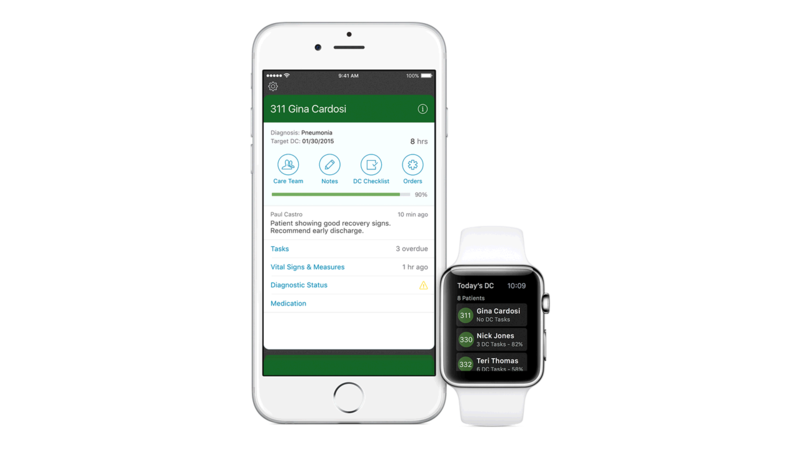 IBM MobileFirst for iOS Hospital MD is tool built for doctors that links patient data to appointments, to-do lists and important alerts. Relevant patient data is synced to your daily agenda for quick access. New patients and those waiting for discharge are ranked and prioritized based on your facility guidelines. Real-time updates and alerts assist your care team to work together no matter where you are located. Tap on Today’s Discharges to pull up a list of patients ready to go home. Quickly view any remaining tasks by tapping on the right-hand side of the row. Using iBeacons, your device automatically pulls a Patient Card up when you enter an individual’s room. The patient’s complete medical record and up-to-date vitals are immediately available for review and updating. In addition to saving time searching for patient information, iBeacon technology helps analyze how much time doctors spend in patient rooms and track direct care time. Tap a Patient Card to drill down and view details about an individual patient. Access the patient’s care team contacts, notes, vital signs, diagnostics, clinical status and medications. Click the details tab to see historical data and track changes for each specific vitals measurement. Tap a week, and the timeframe will increase to show a longer range of time. Swipe left to view this same information for other measurements. Receive real-time alerts and notifications on your iPhone or iPad, and extend them to your Apple Watch if desired. Tap messages to quickly drill into the app and view everything from ER admissions to upcoming appointments. Send orders and complete discharge tasks even while offsite.